Santa Cruz County is continually threatened by catastrophic wildfire, particularly in the wildland-urban interface. Local topography and fuels make the County subject to periodic wildfires. Combined with 100 years of effective fire suppression, these conditions have led to uncharacteristically high fuel loads. 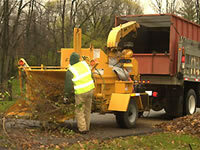 Chipping: Once vegetation is cleared around homes and neighbors for compliance with defensible space guidelines, the material can be chipped and spread on-site to reduce the impacts of green waste. Fuel Load Reduction around homes and structures: California Law requires that any person that owns, leases, controls, operates, or maintains a building or structure in, upon or adjoining any land covered with flammable material shall at all times maintain 100 feet of defensible space. The RCD can provide assistance to landowners that require clearing of flammable materials or creating defensible space on their property, while ensuring that sensitive habitats are considered. Fuel Load Reduction/Fire Breaks in Wildlands: The RCD employs fuels management to reduce the threat of wildfire on private forestland and shrub land areas. Hazardous fuels are reduced through a variety of treatments which remove or modify wildland fuels, thereby reducing the potential for severe wildland fire behavior, lessening post-fire damage, minimizing soil erosion and the impacts to water quality, enhancing wildlife habitat, and limiting the spread of invasive species and diseases. Promoting wildfire awareness and prevention: The RCD promotes wildfire awareness and prevention by creating and distributing educational outreach materials to County residents and partner agencies. 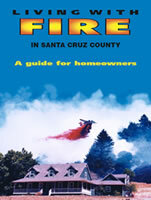 These resources, including the Living with Fire in Santa Cruz County Guide, RCD Chipper Program Flyer, Defensible Space Trifold and Firescaping with Appropriate Plant Lists, are available on the www.rcdsantacruz.org website. The RCD also works with partner organizations to sponsor workshops to provide information and cost share assistance for wildfire prevention and recovery strategies regarding fuel hazards, erosion control, soil health and native plant recovery. 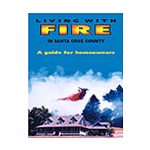 View our publication Living with Fire in Santa Cruz County. Funding may be available to assist landowners who are interested in completing fuel load reduction, clearing or chipping projects. To be considered for funding visit Fire Safe Santa Cruz.